If you are looking for chic and style for your special event, then Banquo wedding chairs for hire provide exactly that. They are transparent and so combined with the right accessories, provide a real talking point. Whilst they are transparent, Banquo chairs are also hard wearing and stackable and why not accentuate your ghost chairs with chair ties and sashes for example, as pictured below. With the range of events that take place around the country, it is important that leading event hire specialists such as Event Hire UK offer the complete range of chairs to cater for different types of events. After all, it’s not a case of one style of chair fits every event. This is why our range of Banquo chairs, also known as ghost chairs, are available and – rightly so – very popular. Banquo chair hire is suitable for high profile events, celebrity events, award ceremonies, fashion shows, gala dinners and so on – in fact any type of event where you are trying to create a stunning look that is different to the norm. Banquo chairs are usually slightly more expensive in price than other chairs to hire, although the look you can achieve is truly spectacular. As a result, hire Banquo chairs for corporate events is also popular, as companies aim to provide a professional look in line with their corporate image. If you are organising a fine dining event in London or any other venue or city, then you might want to considering hiring our clear dining Banquo chairs as they are ideal for spectacular one off events such as this. As a premier product, you would expect to see Banquo chairs alongside beautiful linen, top quality ellipse cutlery, superb glassware and other high quality pieces of event equipment, to differentiate your quality event from others. Let’s face it – there is nothing better than guests walking into an event venue and saying “WOW!” If they do this, then you know that you have created a superb spectacle which your guests will enjoy and talk about for years to come. Guests are sure to enjoy sitting on your ghost chairs as this is something that you don’t normally do. 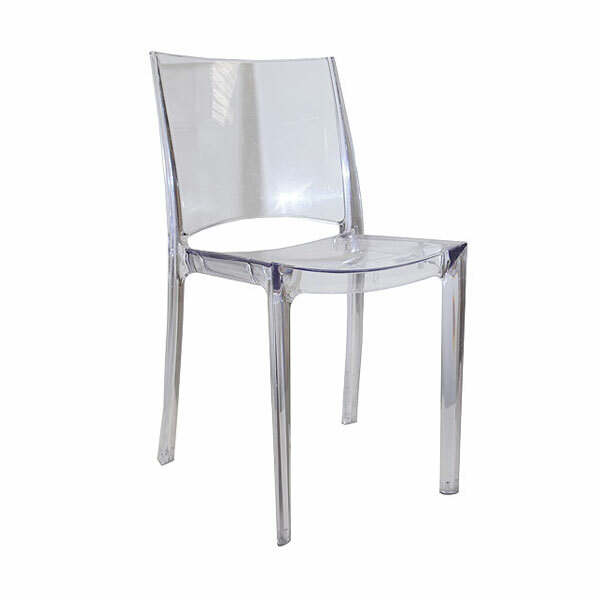 Modern, cutting-edge events such as fashion shows lend themselves to the hire of transparent ghost chairs as these stylish chairs for hire give the event something different to the norm, especially if corporate brands and designers are showing off and launching their latest spring or summer collections. Hire see through chairs for fashion shows and you will receive our Banquo chairs which are both affordable and hugely stylish! Ultimately, ghost chair hire provides you with something out of the ordinary for your upcoming event or special occasion. Their contemporary style means that you can create wonderful settings for your event, though of course ghost chairs are not necessarily suitable for all event types. Yes they are perfect for modern dining events, but not so much for traditional occasions. Let’s face it, there are no hard and fast rules when it comes to ghost chair hire – it’s down to the event planners, organisers and professionals in charge of the event to determine which chair hire product best suits, and at the price point within their budget. Event Hire UK assures you of fast, reliable and accurate delivery of hire ghost chairs wherever you are in the UK. Our years of experience mean that you are assured of superb customer service from start to finish, efficiently completed from our nationwide sales and distribution centres. Event Hire UK is SafeHire accredited and award-winning for a reason, so why not try us out today!